Mt Ngauruhoe, photographed from Restful Ridge, Mt Ruapehu. At 2287m, Mt Ngauruhoe is the third highest North Island peak on our list, and its classic volcanic cone shape make Ngauruhoe a peak bagger’s favourite. After featuring in Peter Jackson’s “Lord of the Rings” as Mt Doom, and with Ngauruhoe’s access from the Tongariro Alpine Crossing, you are likely to have a lot of company on a fine summers day. It is not to be taken lightly however, as its steep scree slopes and alpine conditions make getting to its summit a challenging but rewarding day tramp. Most people planning to hike the Tongariro Alpine Crossing base themselves in Whakapapa Village, Ohakune, Turangi, or Taupo, and all are with striking distance of the the Mangatepopo road end. The turn off from State Highway 47 on to Mangatepopo Rd is about 5km north of the Whakapapa Village turnoff. Be warned that you park your car at the Mangatepopo road end at your own risk. Theft from parked vehicles is common here, and you should not leave any valuables in your car or campervan. There are a number of shuttle services which take visitors to the Tongariro Alpine Crossing, and you can also use these services for a Mt Ngauruhoe trip. You need to make sure you enquire ahead of time about being picked up from the Mangatepopo carpark at the end of your tramp. Many of these companies cater for the one way Mangatepopo to Ketetahi trampers, but may make additional pick ups upon request. It’s more secure for your car. You have someone expecting your return, and who can raise the alarm if you get in trouble. You don’t have to drive home at the end of a long hard day! The steep scree climb from South crater to the summit of Mt Ngauruhoe requires a good level of fitness, as the ascent is often two steps forward, and one step sliding down again! From south crater, allow 2 hours up, 10-30 minutes at the summit (but do not venture into the crater), and 30 minutes for the scree run down! Although a return journey from Mangatepopo road end is the quickest, there are numerous overnight options for bagging Ngauruhoe. You could start on the Ketetahi side, and stay at Ketetahi Hut before continuing the Tongariro Crossing before taking the side trip up Ngauruhoe. 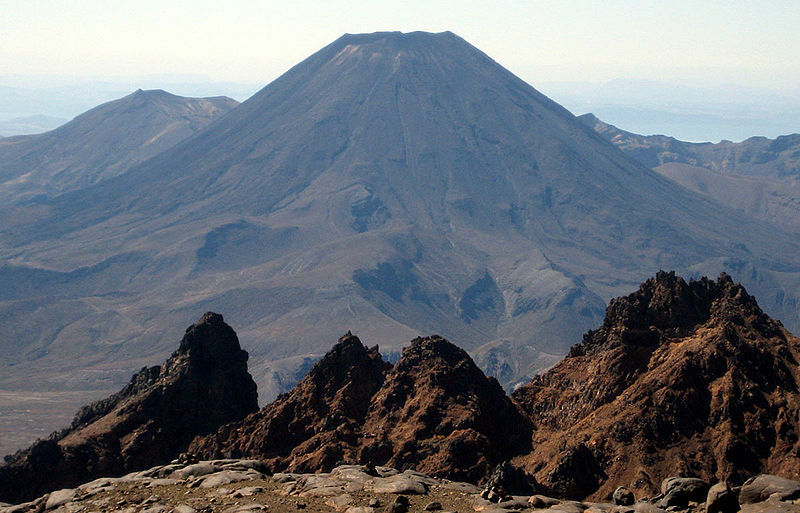 You could also bag Ngauruhoe as part of the Northern Circuit tramp (3-4 days). Another popular option is to simply continue on with the Tongariro Crossing after the 3 hour Ngauruhoe side trip. You would finish this long day tramp at Ketetahi. Mt Ngauruhoe and the Tongariro Crossing is located in an alpine environment. From May to Dec it is likely you will find snow or ice on some sections of the tramp. At all times of the year, the weather can be very changeable, and many many people have needed to be rescued from this environment (they were the lucky ones). You need to take appropriate windproof clothing and tramping boots. You should check local conditions with DOC Whakapapa (07 892 3729) and also let them know your planned movements. If DOC says not to go, do not go! Remember also that Mt Ngauruhoe is an active volcano, which last erupted in 1975. Do not climb into the crater as there may be toxic gases. You can check the GNS website for volcanic alert bulletins, or check out their Ngauruhoe seismic drum! Don’t let all this put you off however, as in the right conditions Mt Ngauruhoe is magnificent! Make sure you go in the ‘right’ conditions.